AH HA! Didn’t think today of all days a gaming article would pop up. Surprisingly when the gods of the website called down upon me and uttered the term “Shakespeare Day” I went a bit mad. You see there are very few games which directly focus on Shakespeare’s plays and none which have reached critical acclaim. Yes we all know about Arden but I am talking BIG success not closed down educational games! Hell some games I found I didn’t know existed until I used a search engine. 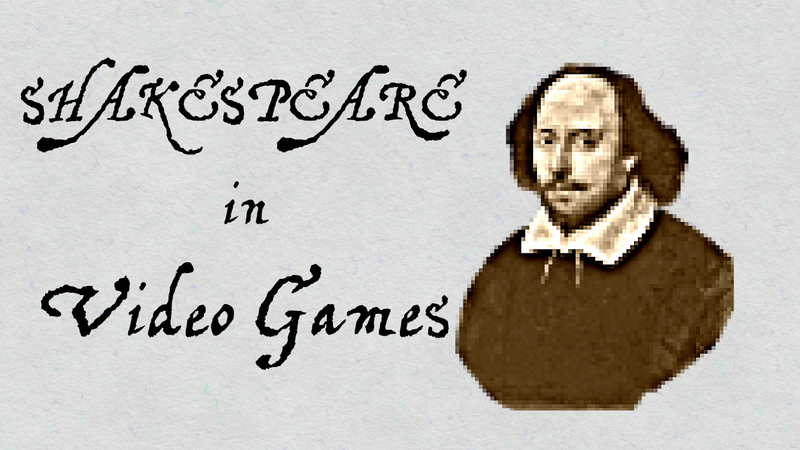 Despite no one achieving The Bard’s greatness by literally making a play into a game there is a surplus of Shakespearian references in the gaming world waiting to be mentioned. It’s strange… It’s as if those who write, create and produce these games have a literary background… Do note I am not just picking any old reference, hell most media has picked up a skull and spoken to it for comedic effect, I want to introduce you to the good stuff. Anyway I want to make a SPOILER ALERT right now, frankly I don’t think I could write this article without it. So in no particular order let’s get started! Starting off this list is the very random but exceptionally placed reference thrown into the Mass Effect series. The game has already proven it has a sense of humour time and time again but occasionally this humour is placed deep within the background. I am of course referencing to the Elcor “Hamlet” advert which appeared in Mass Effect 2. For those who are not familiar with the Elcor race here is a little clip. Basically what I am saying is the Elcor are the alien equivalent of Ben Stein. They have an elongated drawn out monotone voice and string together words with an emotional prefix to make sure you know what they are trying to convey. In fact if you dig through the game’s Citadel DLC in Mass Effect 3 you can find the star of the Elcor Hamlet literally reciting lines begging to find an agent for this “talent”. Just to add amusing insult to injury the producer of the first alien play can be found considering MacBeth as his next magnum opus. There are very few ways I could explain that any clearer, the clip covers it perfectly. Going into a spinal tap frame of mind it was possible to see there IS in fact a secret subliminal learning, frankly I don’t know why they don’t try that method at school. Would of worked on me, I had the attention span of a potato when in the library! This puzzle in Silent Hill 3 may have killed people both digitally and internally. Silent Hill already has an infamous track record of psychological warfare and brown trouser-ing. It also has a very well established difficulty curve when it comes to its puzzles. One of these puzzles is the “My Bestsellers” bookstore which is located in the central square shopping centre. Let’s make a point right now and remind ourselves that this is NOT an Easter egg, it’s embedded into the very core of the game and you must complete it to continue forward. Now if you’ve got the spinal fortitude of a worm you picked the “easy” difficulty when playing the game this challenge is a breeze… But if you’re a sadistic and went for hard difficulty you must wade through 8 different verses of ol’ Bill’s work and then organise them into 5 different anthologies; Romeo and Juliet, King Lear, MacBeth, Hamlet and Othello. This sort of puzzle would stress even Kelsey Grammer. So who can spot it yet? Or maybe your memory is not that good? No? Well let me lay it out for you. Veronaville was one of 3 pre-made neighbourhoods in Sims 2, the name of the ‘hood is obviously a reference to Romeo and Juliet in Verona but the writers felt like there was more fun to be had… The families within this little section of society were the Capp family and the Monty family. To be sure you didn’t miss the reference there is another literary blob thrown at you with the Summerdream family. Not enough? Well how about the house names! Avon Avenue, Bard Boulevard, Stratford Street, Poet Place and my personal favourite… Pentameter Parkway. All of these are references, every single bloody one. Surely NO ONE can top that? Oh yeah… Them… Final Fantasy is actually the biggest exporter of Shakespearian references and really tipped the boat when releasing FFIX. Puck is a regular appearing character named after the devious little sprite from a Midsummer Night’s Dream and he suits the character exceptionally well. Not only does this little rat child pop up unexpected and unwittingly he doesn’t seem to have a greater plan, merely fumbling along from point to point while dragging along our favourite black mage Vivi. There is also a play which is performed on the first disc which seems to be a mix of King Lear and Romeo and Julietto the point where even names are plucked out of the sky and thrown into the script. I felt like the Japanese were afraid of copyright (For some reason) by carbon copying the plan so instead stole names like Cornelia from King Lear and named a character Lord Avon to make sure people knew what they were watching. The concept that all of the Final Fantasy games have a shaky playwright backbone has been suggested. Every script written seems embedded in an unknown event, a world unfolding, constantly throwing tragedy and comedy together in the same scene, it’s hard not to see a Shakespearian pattern forming. Hell some people even regard the death of Aerith to be a true reflection of The Bard. Sure you could say that about any game with turmoil and tragedy but if you remember that Cid and Barrett are both in a game with Sephiroth, Cloud and Aerith it’s kind of hard not to wonder… There is also the constant use of royal families, forbidden romances and clownish companions throughout every final fantasy game which scream Shakespeare all over. Hell even RIGHT NOW people are wondering about the newest Final Fantasy game XV and if it has a bit Bill in it. Once more a reference appears into the fray by literally quoting Hamlet with “There is nothing either good or bad, but thinking makes it so”. Hold on a second… What’s our motto again?